L.A. 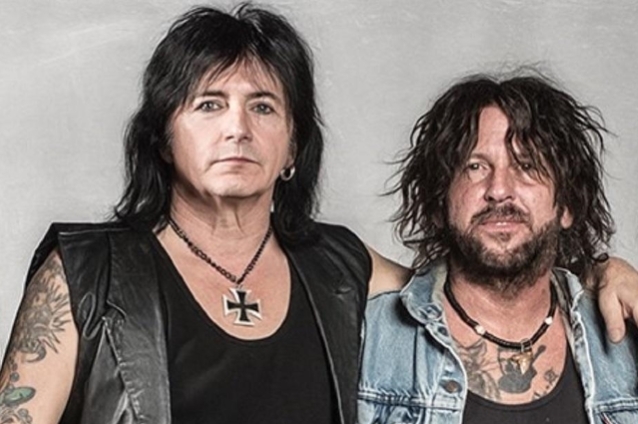 GUNS singer Phil Lewis says fans should trust him and guitarist Tracii Guns to employ "the best players available" as the number of musicians who've been in various iterations of the band approaches the half-century. Guitarist Michael Grant was sacked from the Californian outfit this year and replaced by Johnny Monaco, who only lasted 12 shows. Some estimates had Monaco as member 49. Adam Hamilton, a former bass player with L.A. GUNS, has now returned as guitarist. "I think it's pretty much accepted now that if it's me and Tracii playing together, then that's L.A. GUNS," Lewis, 61, tells the latest episode of "White Line Fever" podcast. "That's the nucleus and trust us, we'll get the best players available." Lewis has never explained the reasons behind Grant's sacking earlier this year but admits it's preferable not to keep chopping and changing. He says: "Of course — but there are situations, you know, that are beyond our control. If something comes up and somebody can't stay and they've got to move on, you've got to replace them. So, you know, it has to be fluid. "I think a lot of of people are curious why we didn't get Mick [Cripps] and Kelly [Nickels] back in the reunion, the original bass player and guitar player. The fact is that we asked them and they either didn't want to or they couldn't. Mick couldn't because he's got family, he's got the whole business and everything. And Kelly didn't want to so we just sort of forged ahead with the players that we had." Monaco, formerly of ENUFF Z'NUFF, left because he didn't feel the band was "a good fit". "There are somewhere near the 50 mark of people out there that can say at one time they were a member of L.A. GUNS," Lewis says. "That's pretty funny, if you ask me. That's what happens when there are two versions of the same band touring at the same time. It happens. It's just one of those things. It's disastrous. It's terrible for fans, terrible for the two bands involved in it but it was just the reality that we were dealt. It was just something we had to deal with professionally. And when you've got two touring bands going through various players frequently, as you do in touring situations, it doesn't take long for the numbers to go up. "To be fair, the people that I played with, there's been about 10 people in my life, in my experience of L.A. GUNS. There's been around 10 different players, which isn't very much, certainly not much when you think I've been doing it since '87. "There was a band when I wasn't in the band for years. You know, I left. I left the music business. They had all kinds of members. The guy Ralph [Saenz], STEEL PANTHER, he was the singer in L.A. GUNS. He did a pretty good job. Jizzy Pearl, of course. Chuck [Garrick], the bass player from Alice Cooper's band, was in L.A. GUNS for a time. Unfortunately, I wasn't in the band. I'd love to have been in a band with him. But ... this is L.A. GUNS. You never know, he might be in it next week." L.A. GUNS' latest album, "The Missing Peace", was released last October via the Italian record label Frontiers Music Srl.